"Trace" is one of those words that soap makers throw around that means something slightly different to each person. 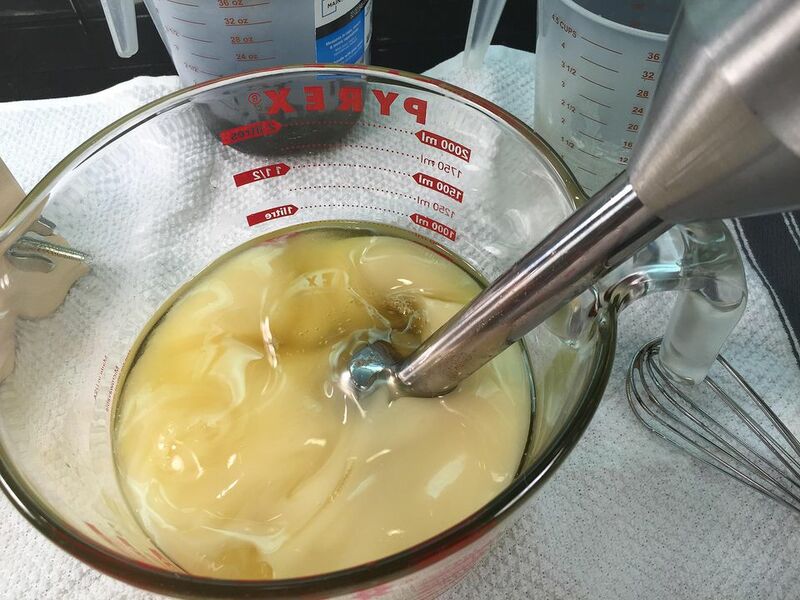 Trace is basically the point at which the soap has thickened and blended enough to have formed a stable emulsion. It's a "point of no return" where the oils and lye are no longer at any risk of separation. Past that "point of no return" there are a lot of variables. There are soap makers that pour at "very light trace" which may just take a few short blasts of the stick blender to achieve. The soap will still be watery and won't be able to support the tell-tale traditional "dribble" of soap on top of the mix, yet it will still be well mixed enough to not separate. On the other end of the spectrum, there are soap makers who prefer to pour (or scoop) at "heavy trace" which is thick and pudding-like. Both mixes are fine, and both could have been said to have reached trace. But what about the time it takes to reach trace? Regardless of whether you pour at a light or heavy trace, sometimes it takes a while to get there, and sometimes it happens quite quickly. What causes this? Kevin Dunn, in his wonderful book Scientific Soapmaking, says that the amount of mixing directly is the primary determinant of the time it takes soap to reach trace. That's why using a stick blender is so much quicker than just stirring with a spoon. But above and beyond mixing, he says, there are three factors that can affect the time it takes for soap to reach trace: water content, temperature, and catalysts. How much water you use in the recipe affects trace. More water means a slower trace. If you have a recipe that calls for four ounces of lye and you use eight ounces of water, all other things remaining equal, it is going to get to trace quicker than if you used 10 or 12 ounces. If you have a recipe that is getting to trace too quickly, you can add more water to it to slow things down. The higher the temperature, the faster your soap will reach trace. Even the difference of just 10 degrees, soaping at 100 degrees F rather than 90 degrees F can make a difference. If you have a recipe that's moving too quickly, drop your soap making temperatures. Other than the oils beginning to solidify, you really aren't going to run any risk of the lye and oils getting "too cold." You can make whipped soap with room temperature or even chilled oils and lye. Catalysts are one of the biggest variables in the trace. Most soap makers have experienced a seize when you're making soap from scratch and it goes from liquid to a thick mess in just a few seconds. We're not quite talking about seizing, though. There are other ingredients that speed up a trace, just as lowering your water, or increasing your temperature would. Some oils are slower or quicker to trace than others. But not as much as some particular soap recipe ingredients. Any one factor—the water, the temperature, the ingredients—can affect the speed of the trace. So each recipe is going to be just a bit different. Whether you pour your soap at light trace or heavy trace, it's still going to make soap. As long as you reach that point of no return where the oils and lye won't separate, you're fine. But if you're using intricate molds, or especially if you're trying to create swirls of color in your soaps, you probably want your soap to reach trace as slowly as possible.